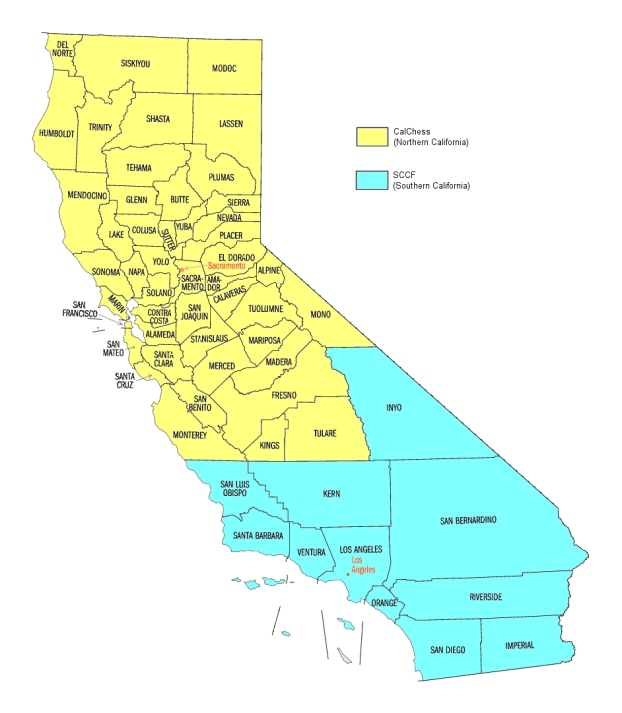 The official boundary between Northern and Southern California was established in 2005 by a vote of the USCF Delegates. Delegates Motion DM05-22 (advanced Delegates Motion ADM 05-14) sponsored by Richard Koepcke, N Cal. states: The border between Northern and Southern California shall be set along California County lines. Where the Northern boundaries of San Luis Obispo, Kern and Inyo Counties form the Northernmost boundary of Southern California. And, the Southern boundaries of Monterey, Kings, Tulare, Fresno and Mono counties form the Southernmost boundary of Northern California. For the purposes of Delegate apportionment, Clearing House Calendars and State elections, the USCF may continue to use ZIP code ranges to approximate these borders. Rationale: The purpose of this ADM is to identify the border in exact terms so that there will be no further disputes as to what it is.